In the mid 70s Brad Shapiro was one of a small select band still producing authentic southern soul. His work with Millie Jackson is the best known and most successful but his Kayvette productions for Jackie Moore and the Facts of Life were almost uniformly excellent. 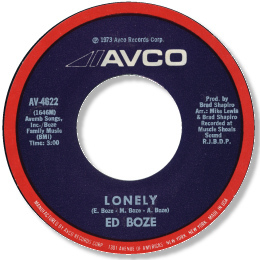 There was also the odd outside release as well – and the two singles by Ed Boze are probably the pick of them. As usual Shapiro used the ace players at the Muscle Shoals Sound studios here, and together with Boze and his family’s songwriting skills and fine baritone voice, they made fine music. Memories is a jaunty mid-paced song with a lovely “walking” bass line from David Hood and a hookline that sticks in the mind. You’re A Part Of Me is similar in feel and almost as good. “Lonely” is the ballad cut from the session(s) and is a kind of “Patches revisited” in it’s storyline, but thankfully not as mawkish. How all this got on &Luigi’s label is anybody’s guess. Wonderful to add that Ed himself has written to me from his North Carolina home to say that he is now a congregational leader, providing counselling for prisoners in several states. "What a genuinely pleasant surprise to find that my music was appreciated. Your site made my day. Thank you always for your support and joy of my music". 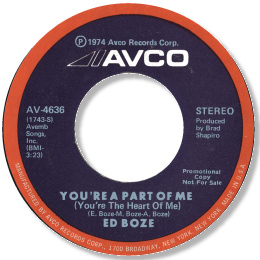 Note – Boze made a cameo appearance as the eponymous “Mister Soul Singer” on Vivan Verdree’s 45, Avco 4650. Thanks to Ed himself and to Pete Nickols for the fine Billboard review below.